Délice Network is the top professional network devoted to expanding economic opportunities and to promoting quality of life by focusing on gastronomy-based urban development. The network brings together city representatives, community leaders, and stakeholders involved in the implementation of food-related projects and initiatives. Délice Network provides them all a network to learn, share and connect. Around the world, most destinations are known for the “must-sees” and “must-tastes” that reflect their culture or define their sense of place. A superstar food might get its title from their community, traditions, history, from a local legend, from a celebrity, or for reasons long forgotten and mysterious. In the heart of the Sonoran Desert, Tucson has understood the opportunities linked to production of the ancient agave plant for the distillation of tequila, mezcal and other agave-based liquors. By organizing a dedicated festival around this versatile plant, the city has embraced its superstar, opening up a series of new opportunities for economic development all along the value chain. 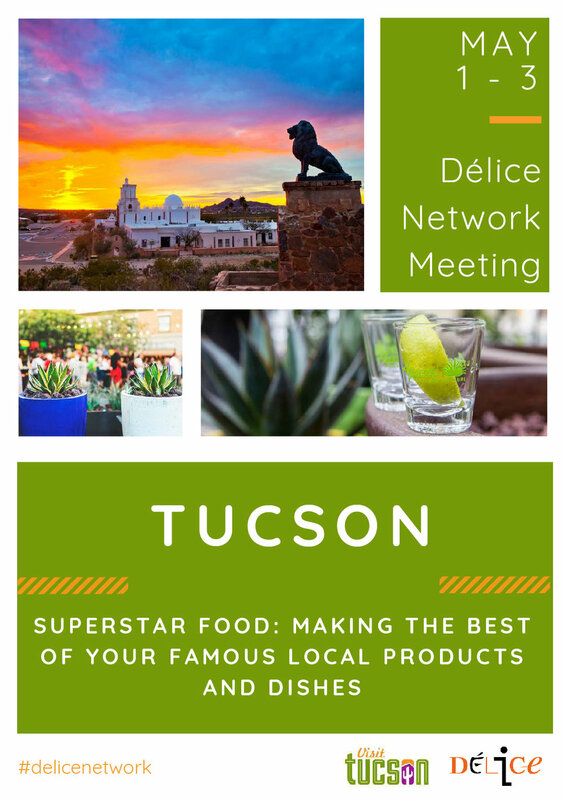 During the Délice Network’s 2019 annual international gathering, Tucson will showcase our unique approach to marketing food & gastronomy, while member cities from around the globe share their own superstar foods and explore innovative ways to use them as strong marketing tools. At the same time, mixologist from different members cities will prepare cocktails using a mezcal based spirit. Member Cities Invited to Tucson: Aarhus, Barcelona, Birmingham, Bordeaux, Brussels, Busan, Cali, Cape Winelands, Chicago, Gaziantep, Gothenburg, Guangzhou, Helsinki, Hong Kong, Izmir, Kobe, Lausanne, Leipzig, Lisbon, Lyon, Madrid, Merida, Montreal, Puebla, Riga, Stavanger, Torino. Guest City: Buenos Aires. Find these guest mixologists from Délice Network Cities at MEZCrawl and Agave: Spirit of the World!